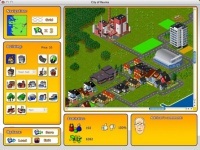 City of Rauma is a simulation game where you are given tasks to develop from small city into a modern and advanced city. It is available for PC and Mac computer. Making sure the citizens happy all the time is the ultimate goal in the game City of Rauma. Simplicity is what you can see when playing this game, but it doesn't lack of nice features such as game speed tuning which you can use to shorten long duration of story.